The Readers of Broken Wheel Recommend by Katarina Bivald is a highly recommended novel of romantic escapism for book lovers. Sara Lindqvist has traveled from Sweden to spend 2 months with her pen pal, Amy Harris in the very small town of Broken Wheel, Iowa. Sara and Amy connected over their love of books and a correspondence began that led to friendship. Amy is shocked to learn that her friend has passed away and she has arrived just in time for the gathering after the funeral. The townspeople Amy meets insist that she stay on at Amy's house, as Amy planned and would have wanted. They have even stocked the fridge for her and put her luggage in the spare bedroom. Sara reluctantly agrees to this and the start of her introduction to the people of Broken Wheel begins as they offer their hospitality to Sara. In an effort to repay the town for their kindness, Sara decides to open a book store for the town. She uses the closed building that Amy owned and collects all of Amy's books together. Her new friends in Broken Wheel help her get furniture and bookcases together, while at the same time coming up with a few schemes of their own. It is well written and has well developed, likeable characters. The novel includes letters from Amy to Sara between each chapter, so you get to read what Sara read before she came to visit. 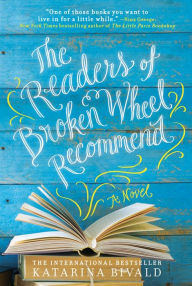 The Readers of Broken Wheel Recommend is a rather sweet book that starts out stronger than it ends (I thought it was going to be 5 stars until the second half) but I don't want to discourage people from reading it because it's a charming novel that includes light-hearted escapism with some romance. Rather than completely an old-fashioned, quaint tale, it is definitely a book of the 21st century, with progressive characters. There is, for example, a recovering alcoholic, and accepted gay couple. Even bisexuality is mentioned. What holds me back from a 5 star rating, besides the slowing down and meandering focus in the latter half of the book is that I couldn't fully accept the premise of the story and suspend some disbelief over the practical difficulties that were just assumed. It would never be that easy to just move into a deceased friend's home and live there for two months. Nor does it seem likely that anyone would be so beloved so quickly. I would guess that there are plenty of readers who would enjoy it and ignore my little quibbles. Disclosure: My Kindle edition was courtesy of Sourcebooks via Netgalley for review purposes. I found this book to be such a delight. Improbable on many levels, but such a fun read just the same. I am glad you liked it too.